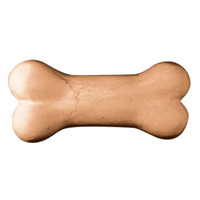 Bone: 1.5" x 3.25" x 0.5"
Paw: 2.3" x 2.375" x 0.375"
"I wish this was a little bigger." COMMENTS: I love to make lotion bars for our furry friends. It is a cute mold, but I wish it was a little deeper in size. 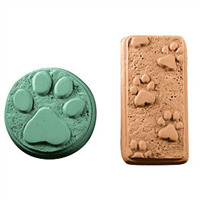 "Bones and Paws Mini Mold Performed Greatly"
COMMENTS: I had made my normal recipe for goat milk soap that is my best seller. 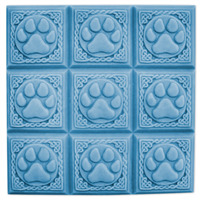 I had some left as I had special orders for 2# molded cold process soap. I did the over-pour in these new molds and found that they set up well. I put them in the freezer for 5 minutes and they unmolded perfectly. I will be putting them in little organza bags to sell at my next fall craft show.